Paintings and tapestries from the High Renaissance period. Most mushrooms are stylized and not always obvious. A few are identifiable. Click on any thumbnail below to enlarge. 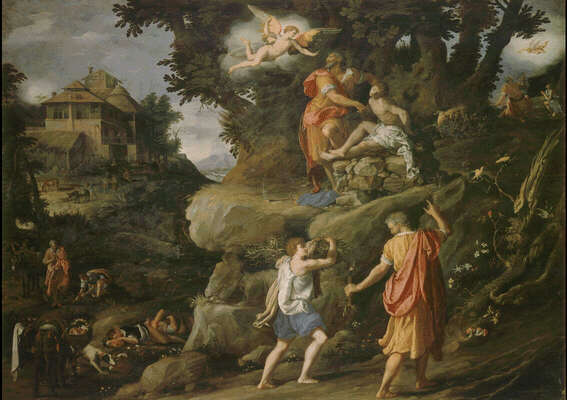 Original source: Tapestry conceived by Bernaert van Orley. Dutch, 1528-31. Woven in Kempereer workshop, Bruxelles. Viewed at: Exhibition, Metropolitan Museum, New York City: Tapestries in the Renaissance. 2002. Medium: Oils on wood; size: 94 x 131 cm. Mushroom description: Amanita caesarea and other capped mushrooms in the lower right. Reference: Berti, L., et al. The Uffizi. Scala. Milan. 1980. Mushroom description: Two boletes, growing on a dead tree. Both have brown pilei and white stipes. One is approximately 5 x 12 cm. and has a closed white veil, the other is approximately 12 x 8 cm., with an open veil. Reference: Magnificenza! The Medici, Michelangelo and the Art of Late Renaissance Florence. Yale Univ. Press. 2002. Original source: Grimani Breviary. 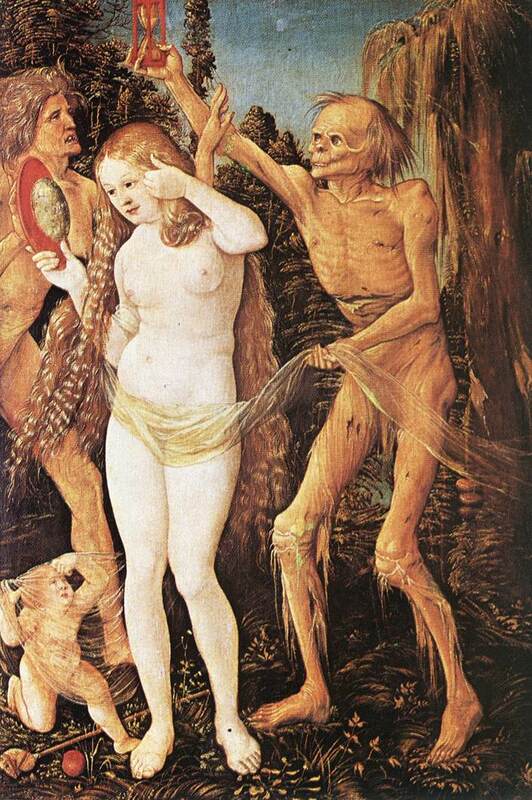 Miniature produced in Bruges between 1496 and 1506; attributed to Memling, Gerard van der Mere, and "Liven de Gard." Reference: Les Saisons, Collection Prière de l'Art, Ed. Desclée de Brouwer, 1954. Reference: Wasson, G. and V. Mushrooms, Russia, and History. New York: Pantheon Books. 1957. Mushroom description: Human face. The ear is a gilled mushroom. Reference: Krigeskorte. G. Arcimboldo, Cologne, 1988. Schneider. Stilleben, Cologne. 1989. Note: A painting by the same title is mentioned as missing in Krigeskorte. G. Arcimboldo, Cologne, 1988. A similar one is in a private collection in Bergamo, Italy (see Krigeskorte). Medium: Oils on panel; size: 67 x 51 cm. Mushroom description: Two polypores, perhaps Ganoderma, serve as the lips to a figure otherwise composed of wood. Reference: Brockhaus Enzyklopedie, Vol. 2. Mannheim, 1987. Note: A similar painting, dated 1572, Oils on canvas, 92.7 x 71.7 cm., is in the Dominique de Menil Collection, Houston, Texas. Others works by the same title are in a private collection, the Louvre, the Bayerische Staatsgemäldesammlung, Munich, and in a private collection in Bergamo, Italy. Reference: Krigeskorte, W. Arcimboldo, Cologne. 1988. References: Krigeskorte, W. Arcimboldo, Cologne. 1988. Fruth, H. J. Rhein-westfalen Z. Volkskunde. 1993 (18: 183). Meisterwerke der Kunst. Chur. 1994. Note: Wasson, G. and V. Mushrooms, Russia, and History. NY: Pantheon Books. 1957, notes that other Arcimboldos with mushrooms are owned by the Mable Ringling Museum of Art, Sarasota, Florida, and by Edward James, Esq., Chichester, UK. There are several more. Medium: Oils on limewood; size: 48 x 32.5 cm. Medium: Oils on canvas; size: 206 x 154 cm. Medium: Oils on oak; size: 50 x 80 cm. Princeton University Art Museum has one similar to the above. Reference: Mentioned in Wasson, G. and V. Mushrooms, Russia, and History. New York: Pantheon Books. 1957. Medium: Oils on panel; size: 33.5 x 46.7 cm. Reference: Sotheby's. Old Master Paintings, Part two. December 13, 2001. fig. 104. Size: 52.3 x 68 cm. 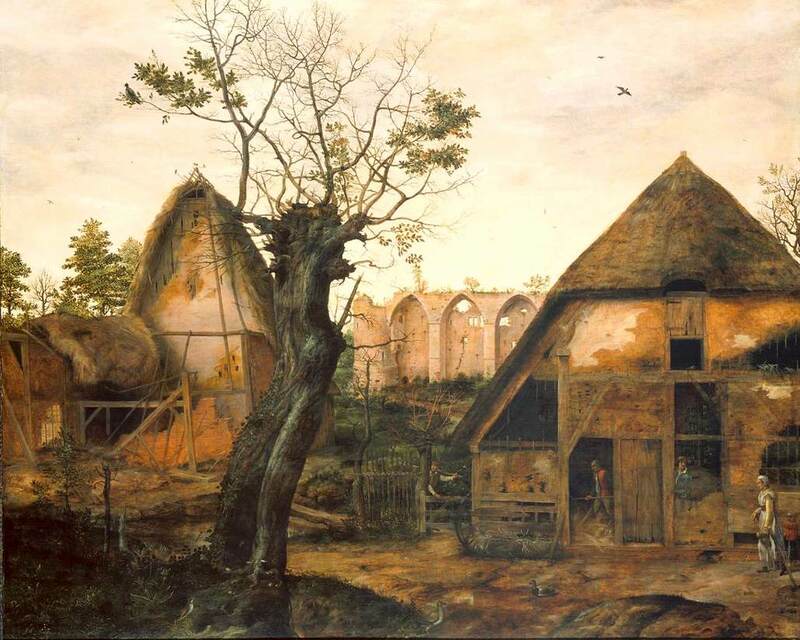 Reference: Le Siècle de Bruegel-a peinture en Belgique au XVIè siècle. Musées Royaux des Beaux-Arts de Belgique, Bruxelles, 27 sept.-24 nov. 1963. Mushroom description: Two mushrooms and a cluster of vaguely discernible; mushrooms are to the right of the tree stump. Russulas, boletes? Mushroom description: A cauldron of food in the center of the room shows several stipitate mushrooms, perhaps Agaricus. Medium: Oils on panel; size: 95 x 160.5 cm. Medium: Oils on panel; size: 69.5 x 116 cm. 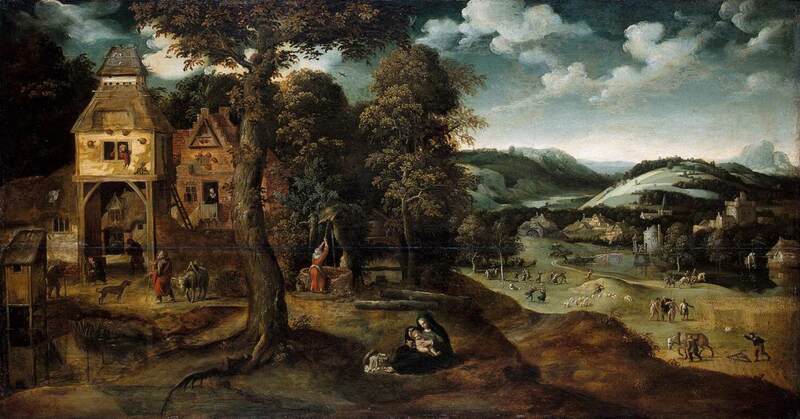 Reference: Bekkers, L. Breughel Pieter de Jonge. Kunstbeeld 5-98. Joseph is Recognized by His Brothers. From “Story of Joseph” (tapestry) With Raffaellino dal Colle. Borders with Lorenzo Zucchetti and Alessandro Allori. Woven in the workshops of Nicolas Karcher, Florence, 1550–53. Size: 556 x 450 cm. Reference: Catalog, Alte Pinakothek. Munich. 1999. Medium: Tempera on canvas; size: 189.5 x 157 cm. A Woman Selling Apples, Plums, Cherries, Mushrooms, Parsnips…. Medium: Oils on canvas; size: 130 x 160 cm. References: 1. Fabri, editor. Regards sur la peinture 13. 1988. 2. Caravage, Larousse, editor. Histoire de l'Art. Italie 3. Dossier, Art, editor. Calvesi, M. Caravaggio. Giunti (4) Color postcard edited by the Galleria Doria Pamphili, Roma. Medium: Oils on canvas; size: 34 x 46 cm. Medium: Oils on panel; size: 61.6 x 42.2 cm. Mushroom description: Central panel, left side near the middle part: three small whitish Agaricales at the foot of an oak. Medium: Oils; size: 151.5 x 161 cm. Mushroom description: Whitish polypores (Fomes fomentarius?) on a trunk (of beech?) left and right of the signature "NMD"
References: 1. Jörg Huber, Schweizer Malerei von. den Anfängen bis ins 20.Jahrhundert - Im Spannungsfeld, Kunst zwischen Kirche und Welt. Verlagsgesellschaft Beobachter Galerie 1985, 47 pp. + 30 col.illustr. 2. R. Heim, Revue de Mycologie 31(3) 1966. 3. Postcard Nr. 4946, Verlag Kunstmuseum, Basel, Switzerland. Reference: 1. Anzelewsky. Dürer. Berlin-O. 1971. 2. Mittlestädt. Albrecht Dürer. Berlin-O. 1986. 3. Herder. Lexicon der Kunst, Vol. 4. Freiburg, ca. 1985. Reference: 1. Lippmann, F. Zeichnungen von A. Dürer in Nachbildungen. No. 912. Berlin. 2. Winkler F. Albrecht Dürer: Leben und Werk. No. 632. Berlin: Freitag. 1957. Mushroom description: A single mushroom (?) near the right foot of Adam. Note: At least nine Goessaert paintings on this theme are known. It seems likely that mushrooms are found in some of them. Medium: Oils on panel; size: 83 x 111 cm. Grünewald, Matthias = N. G. Nithart. [a]. German. Würzburg 1475 - Halle 1528. The Trial of St. Anthony (Versuchung des Heiligen Antonius) Isenheim Altarpiece, 1512?–1515? Note: Paintings by the same name in the Louvre (1483-86) and the National Gallery, London (1503-06) have no visible mushrooms. Reference: 1. Wasson, G. and V. Mushrooms, Russia, and History. New York: Pantheon Books. 1957. 2. Clavell, Prado-Museum Spanische Kunst. Barcelona. 1991. Departure for the Hunt (Month of March), from "Hunts of Maximilian" Tapestry woven in the Dermormen workshop, Brussels, 1531-33. Patenier, Joachim. Flemish. Dinant or Bouvignes 1485-Antwerp 1524. Robusti, Jacopo, said 'Tintoretto'. Italian, XVIth.s. Suzanne bath (French: Suzanne au bain). Around 1550. Mushroom description: four small white mushrooms beneath a trunk overgrown with ivy. The size of the mushrooms can be estimated if you compare them with the ivy leaves: about 3 to 5cm wide. Presence of a stipe is possible but not clear. Medium: Copper engraving; size: 22.5 x 22 cm. Medium: Oils on canvas; size: 136.5 x 186 cm. Medium: Oils; size: 202 x 152 cm. Medium: Oils on wood; size: 133.8 x 175.9 cm. Mushroom description: In the center, below the left foot of Atlas, two brown, 0.7 cm. Marasmius with pleated caps. Toward bottom of painting with plants and fruits, a white 0.7 cm. Lactarius cap, with red, depressed center.